One of the houses I was eager to see on this past weekend’s Duxbury Newcomer’s Club house tour was this lovely mansard roof Victorian house that I am actually quite familiar with. First a little history – Duxbury was founded in the 1630’s, counting John and Priscilla Alden among its first citizens. The town grew and flourished to its industrial zenith in the early 19th century as a ship building center. The streets are lined with beautiful original examples of Georgian, Federal and Greek Revival architecture. As ships grew in size, however, they outgrew relatively shallow Duxbury Bay and the town’s fortunes declined. As a result, building declined and there are only a handful of Victorian homes in town. Additionally, the original Georgians, Federals and Greeks were relatively unscathed by zealous re-modelers looking to “modernize”. 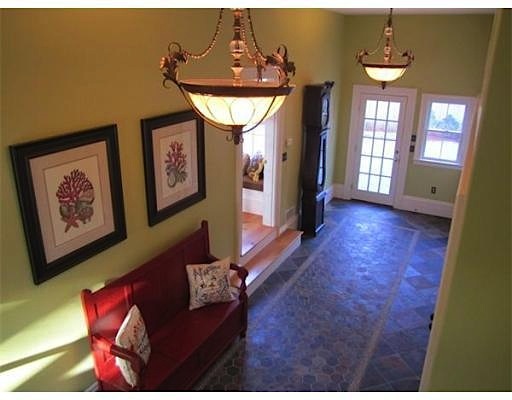 This home was built around the turn of the 20th century and has been added onto twice by the current owners. The original home likely ended about halfway down the side of the house. 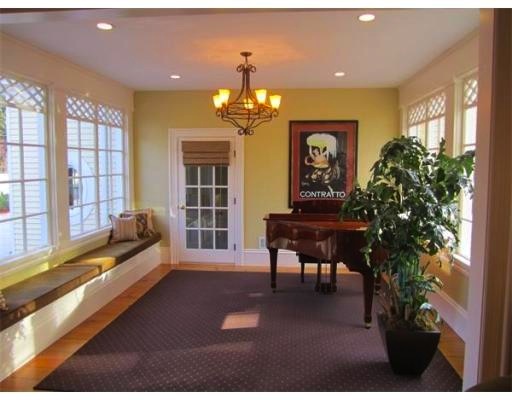 That original section has the formal parlor and dining room, and kitchen. The upstairs had 3-4 small bedrooms. 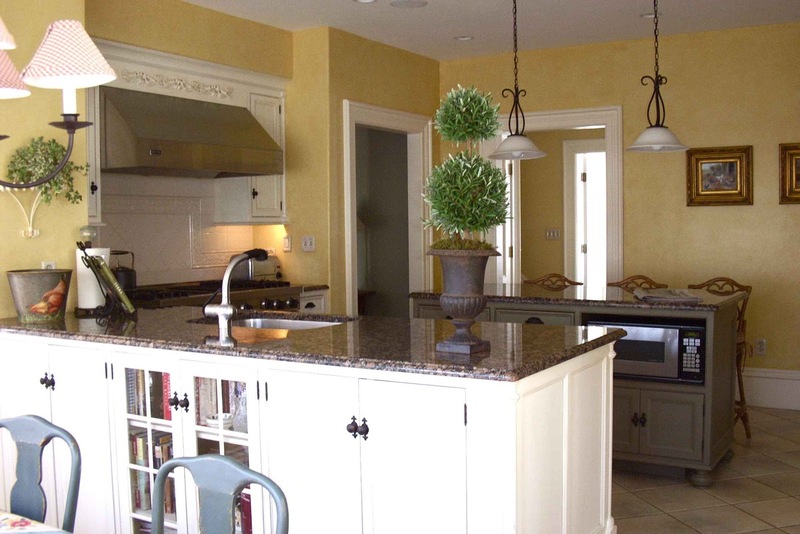 A little over ten years ago, the owners underwent their first renovation and added on another section to the back of the house. There was an old addition that they removed and gave to the neighbors, who were also renovating. Great re-use of materials! In the last couple of years, the homeowners have added another addition off the back to include a large guest suite, home movie theater, and garages. 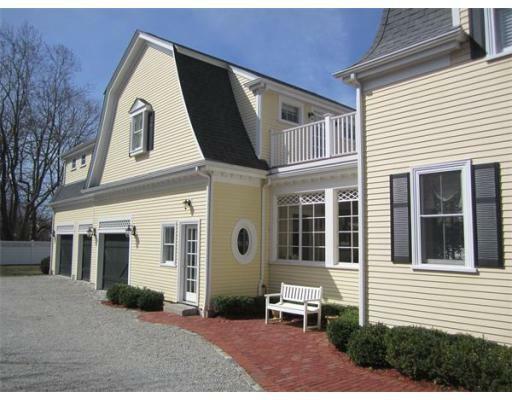 In 2003, I was asked by HGTV’s show “Country Style” if I knew of a beautiful house in Duxbury that would work on the show. I’d just been to a meeting in this house and so I made the connection and the house was indeed showcased on the series. I can’t find the video now, unfortunately. The house is now on the market, so I can finally show the images I took several years ago for HGTV. Most below are my shots, supplemented with the real estate shots of the new addition and exteriors. It’s important to note that the lady of the house largely did her own decorating, bringing in trades people as needed. She did a beautiful job throughout. 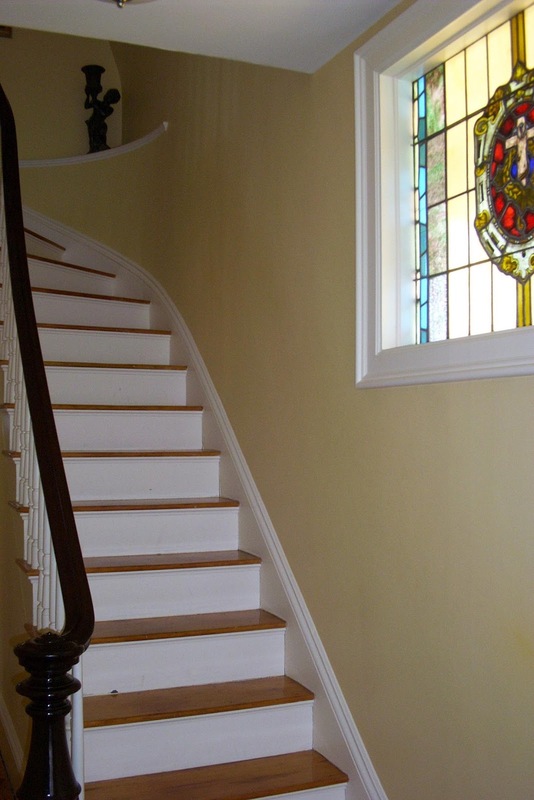 Walking in the front door, we’re greeted by a small front hall and steep curved stairs to the second floor. Appropriate to many Victorian homes, the hall features a stained glass window which lets in a nice filtered light. The original living room is fairly small and very comfortably furnished. The windows on the left are the two front facing windows of the house. The other side of the living room, looking into the dining room. 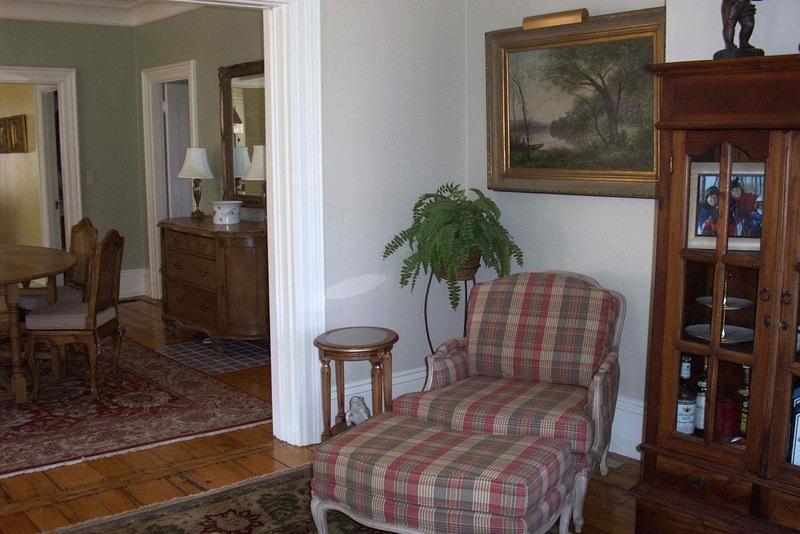 Note the beautiful original pine floors. Based on the break in the flooring between the LR and DR, I’m assuming there was a full wall there at one point. The front hall leads directly to the dining room as well, so this parlor was probably kept only for visitors and had only the one door by the front door. 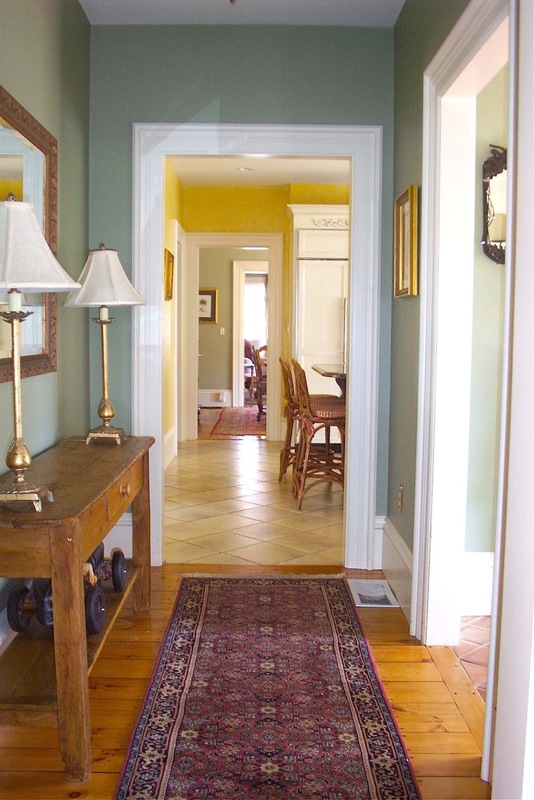 Note in the dining room on the right under the sideboard that there is a patch of blue and white tile inlaid in the floor. There was a wood burning stove here originally and the tile was kept after the stove was removed. 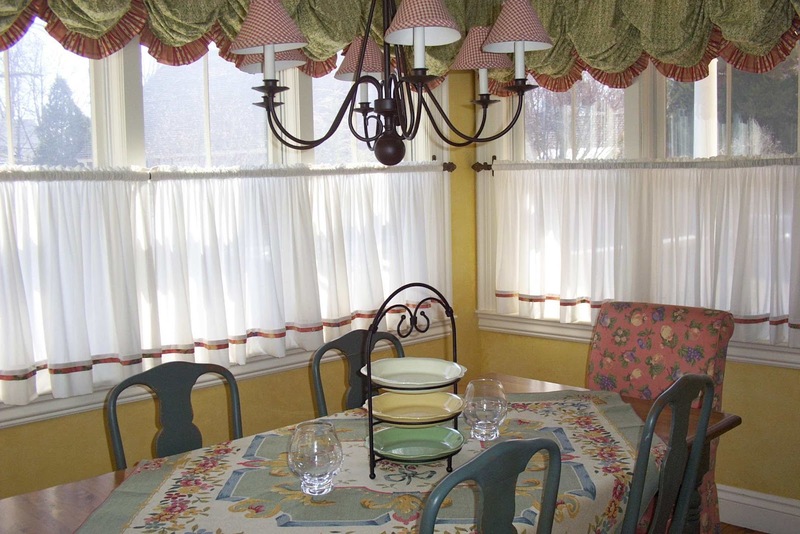 The dining room features rustic French table and cane back chairs, plus a cozy window nook. If you go back and look at the exterior shot above, this is the first little “outcropping” at the end of the side porch. 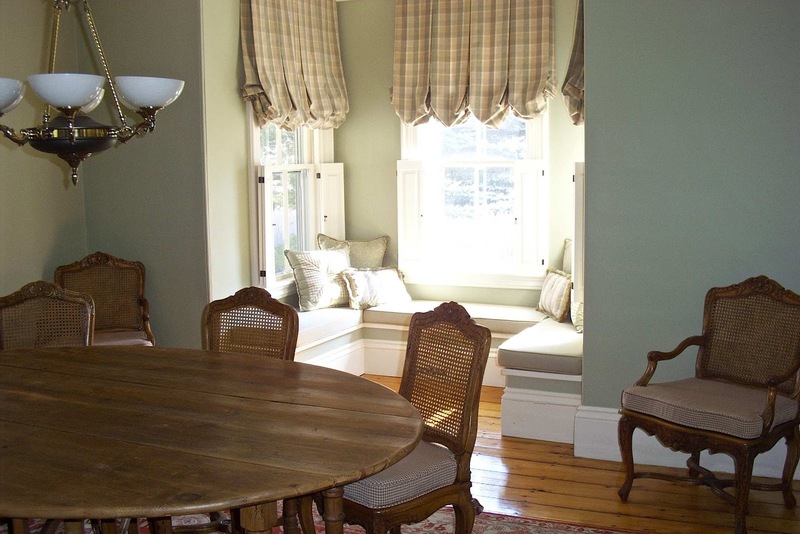 Note that the woodwork in the nook is painted to match fabric on the cushions, which is a nice detail. The pendant lighting is a nice nod to the Victorian origins of the architecture. Off the dining room on the right side of the house is a tiny little home office. This could make someone a fantastic craft or sewing room as well. 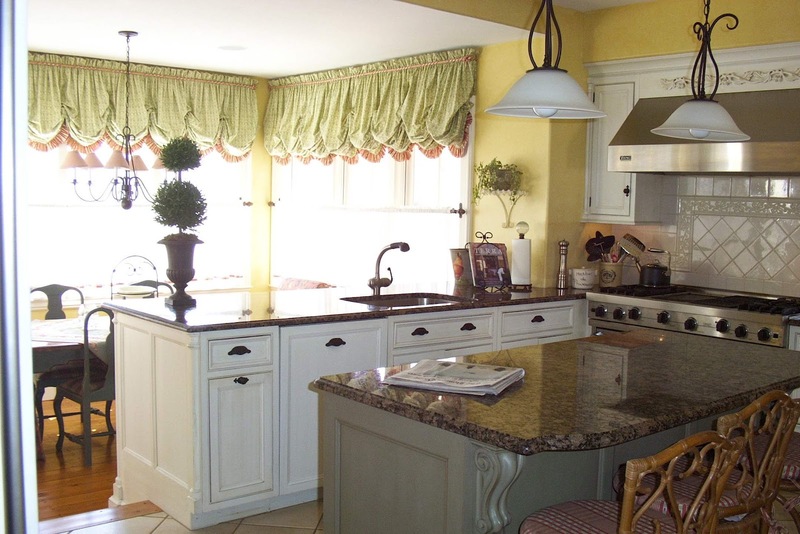 The kitchen features two-toned cabinetry in a beautiful cream and green glazed finish. The step-down seating area is the addition section that came from the neighbors house and is the small addition that sits close to the driveway in the exterior image above. The eating are is cozy and light-filled. 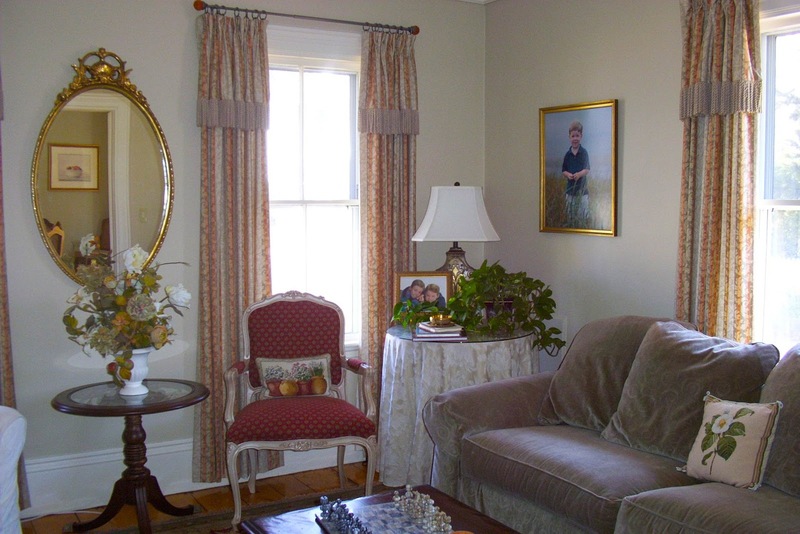 The sheer cafe curtains allow for privacy without darkening the space. door on the left is the hall towards the back of the house. And here is the butler’s pantry. 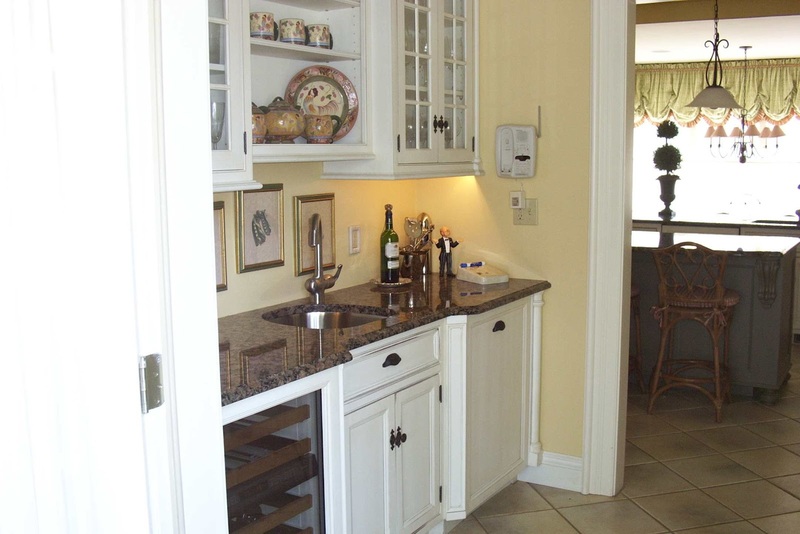 I always prefer these small pantry’s over their companion kitchens for some reason. 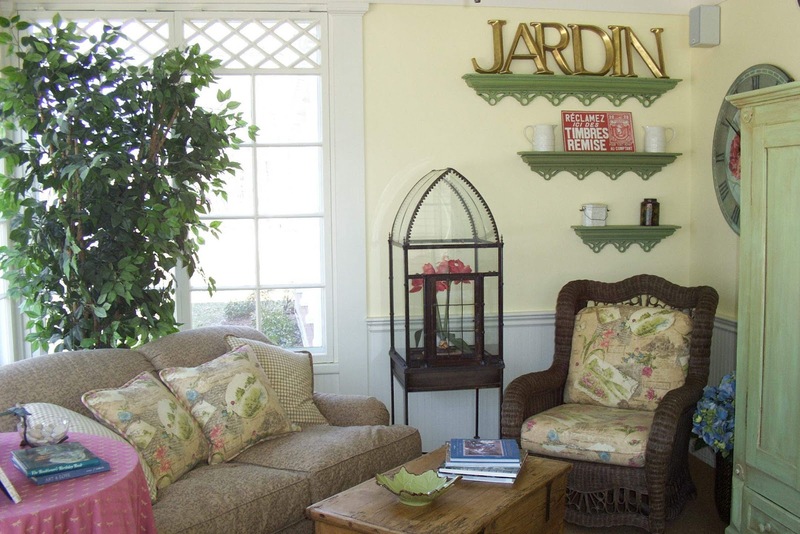 Off the butler’s pantry is an adorable sunroom. 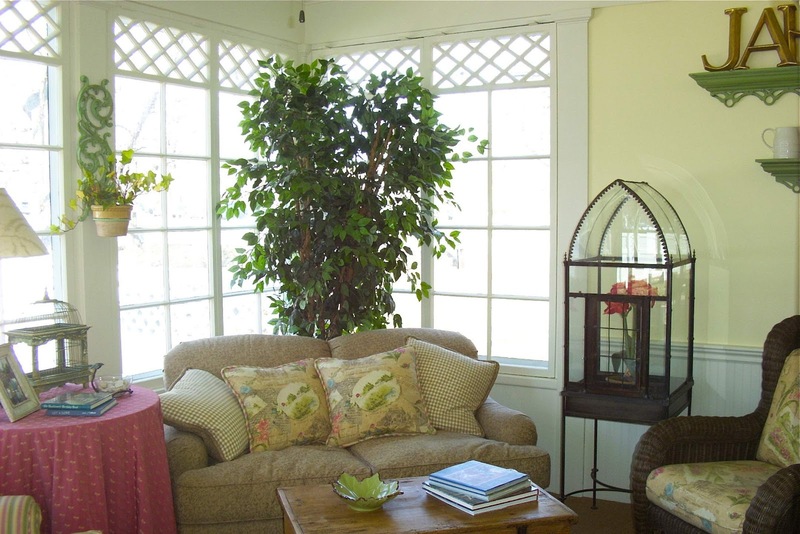 The trellis patterned wood work at the top of the windows is gorgeous and truly enhances the garden feel of this room, as does the color palette, which is continued throughout the house. This hall is the hall off the kitchen with the view looking back into the kitchen, through the dining room to the living room in the front. I always loved the enfilade feel of this shot with the beautiful, soft color palette. The door on the right is a mudroom for the side entrance to the house off the driveway. This was all part of the first addition done by the homeowners. Here is the great room which was part of the first addition. 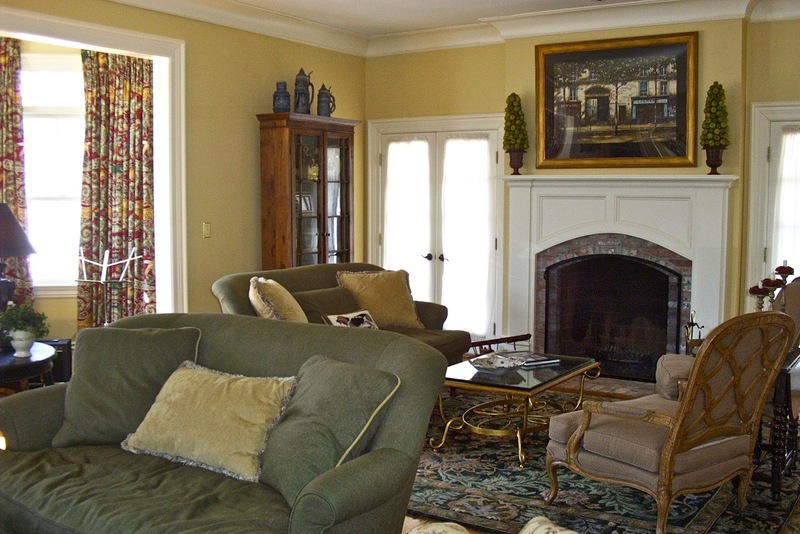 Much larger than the living room in the front of the house, this room is big enough for two cozy seating areas. Above shows the fireplaced side of the room. And here is the tv side. I’ve been in the house several times and the seating arrangement has often changed from two back to back plans, to side by side. All work equally well. 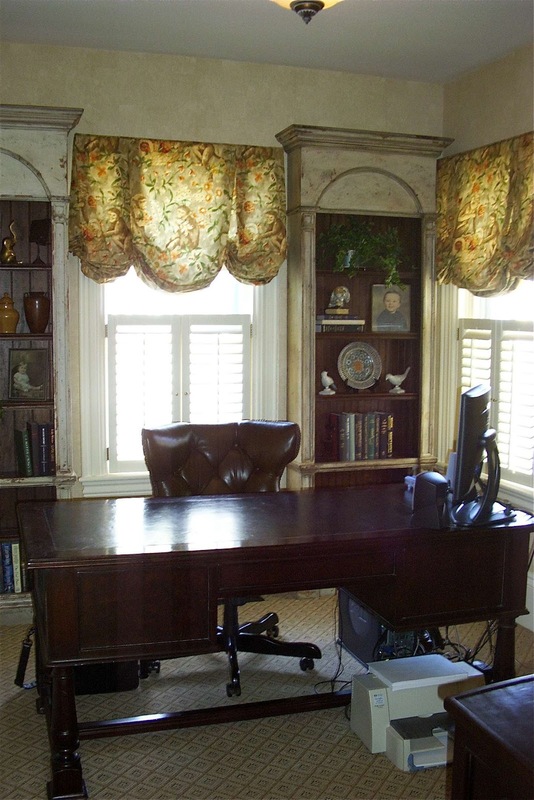 The millwork is beautiful in this room – particularly the recessed window seats that flank the tv. They are actually useful and comfortable! 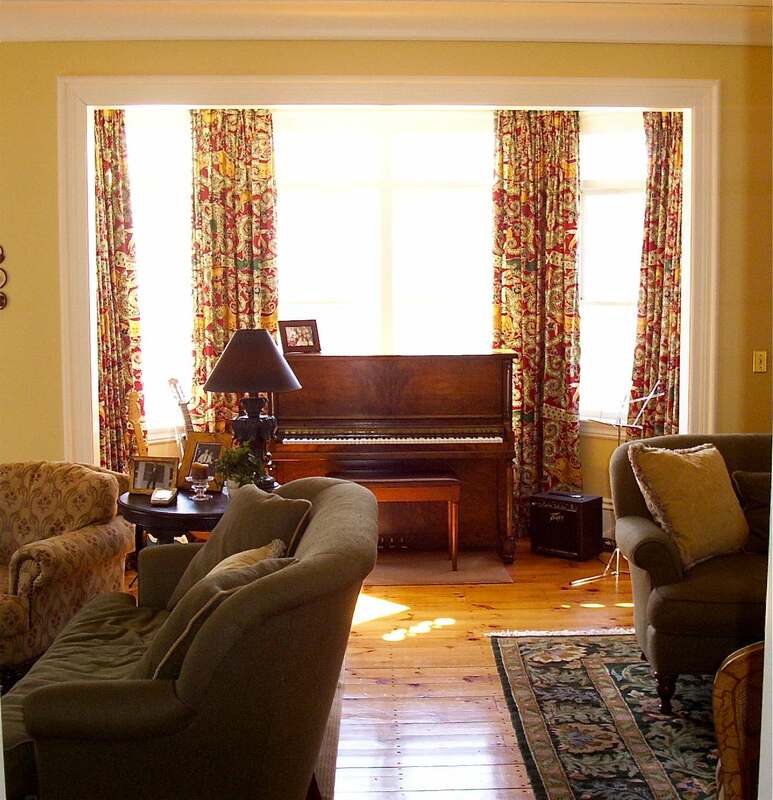 This was the back of the house of the first addition, ending in this little alcove that was their “music room”. 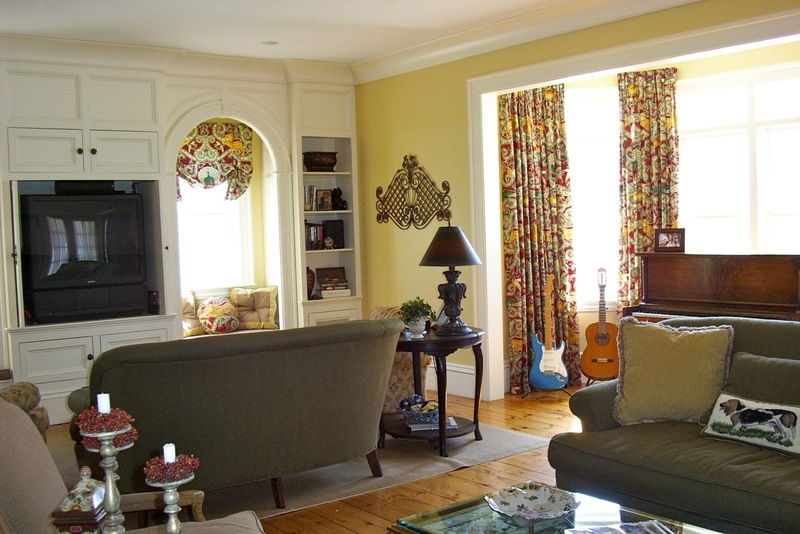 When the howeowner’s added their second addition, the “music room” was extended into a light filled conservatory space that also serves as a connector to the new back of the house. (Somehow the upright piano grew a bit too!) 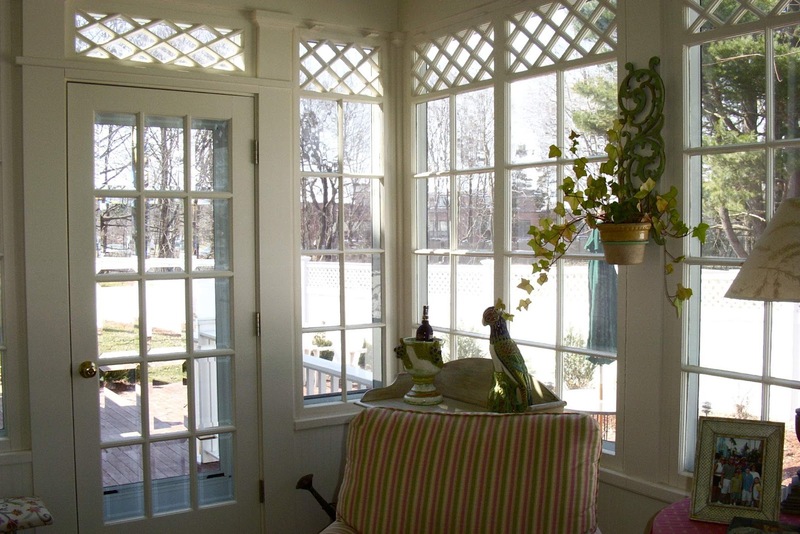 Note the repeat of the trellis patterned millwork style from the garden room. 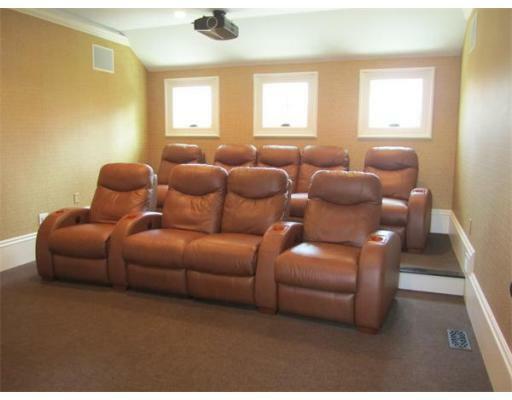 There is a 9 seat home theater with super-comfy chairs, as reported by my client who tried them out, and a 106″ screen. The guest suite’s full bathroom. 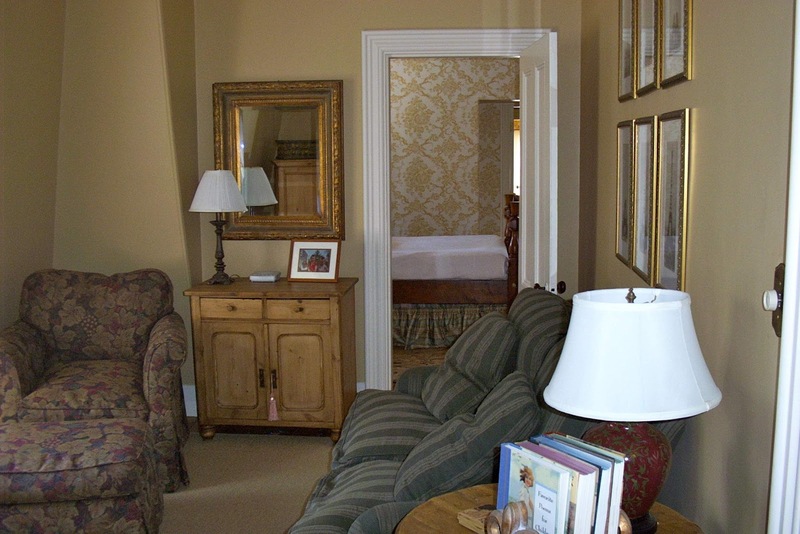 This is the new guest suite with two queen beds and sitting area with a large tv. This photo doesn’t really do the room justice, it was much warmer and more elegant in person. I wanted to stay! Note the small built-in niche next to the bed – makes up for there not being room for a side table. The door between the two beds leads to a connecting deck between the 2nd addition and the first addition. This deck is the roof above the conservatory room shown above. The deck leads to the master bedroom (and back to my photography) featuring a sophisticated black and gold color palette. The door on the left leads towards the front of the house, the middle door to the dressing room, and the door on the right that we see a little of is the master bath. 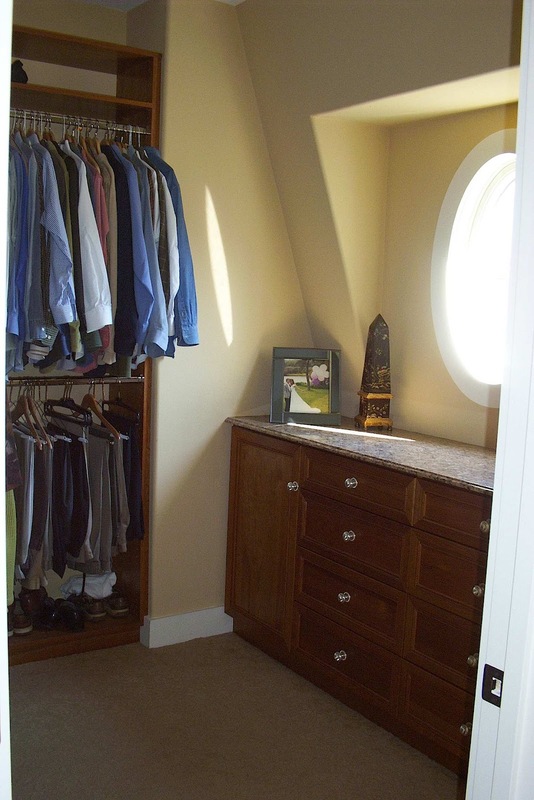 The dressing room features a beautiful oval window. If you go back and look at the exterior shot above, this is the 4th dormered window along the side of the house. 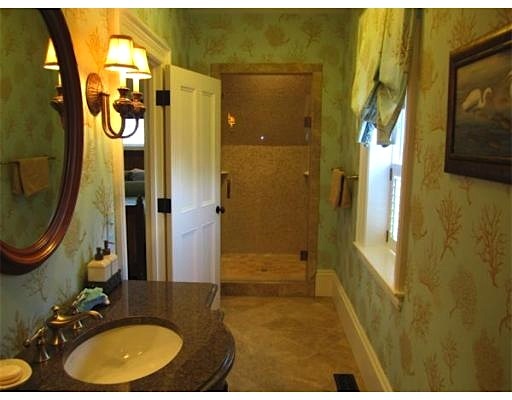 And the master bath (5th dormered window along the house). Note the sloped ceilings – standard for the top floor of a mansard roof building. 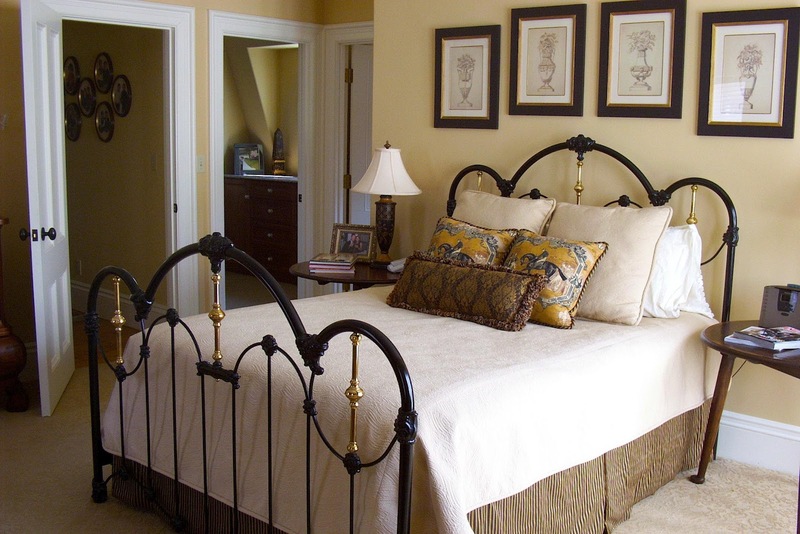 Back towards the front of the house, is another guest bedroom. What could have been a dark space with sloped ceilings and only one window is made brighter by the sunny color palette. This would have been the rear-most bedroom in the original house. You can see the floors match the first floor. 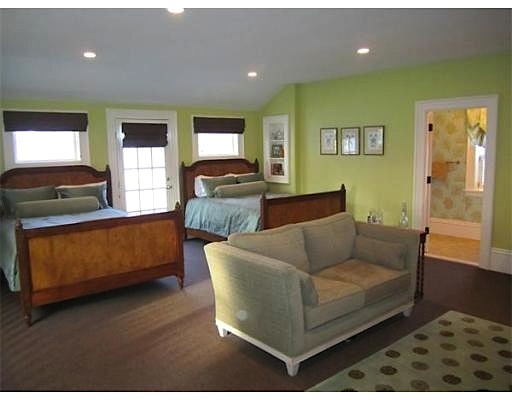 Another small bedroom/sitting area is between the guest bedroom and the front room. This room has a door that leads to the upstairs hall. 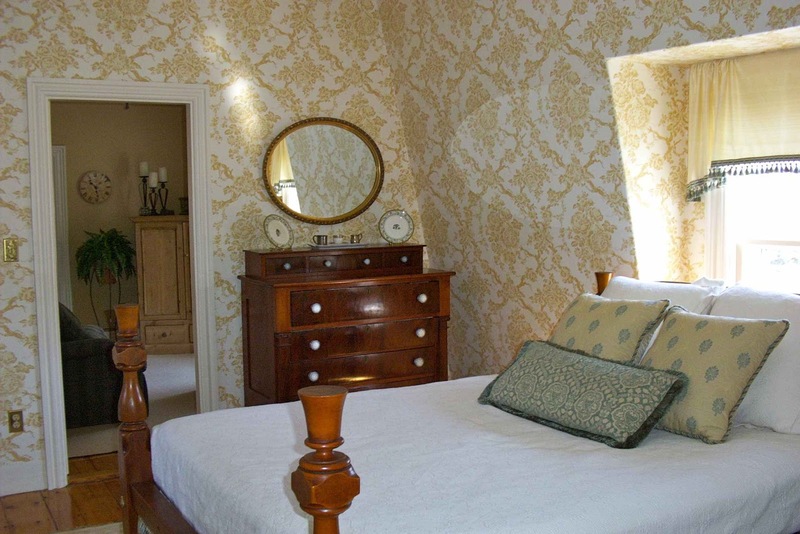 And this is the front bedroom. 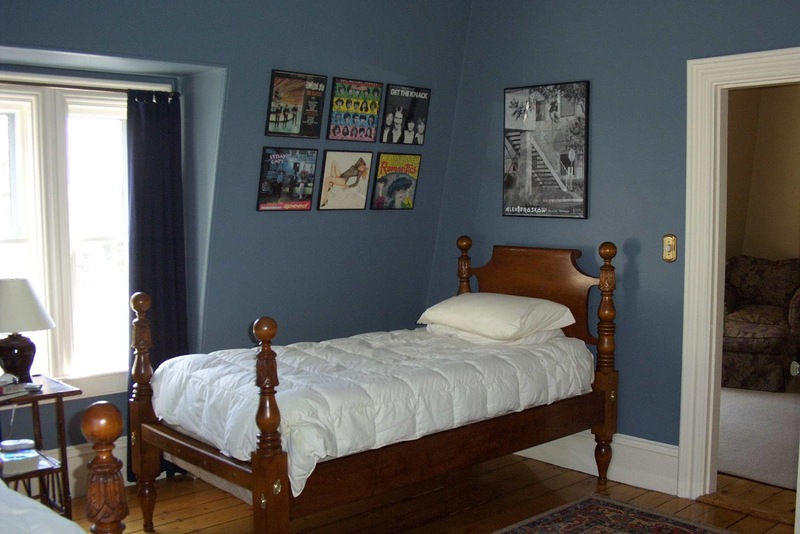 There is a another tiny bedroom upstairs, but I don’t have photos of it. Tired yet? Let’s head back down two levels to the basement. 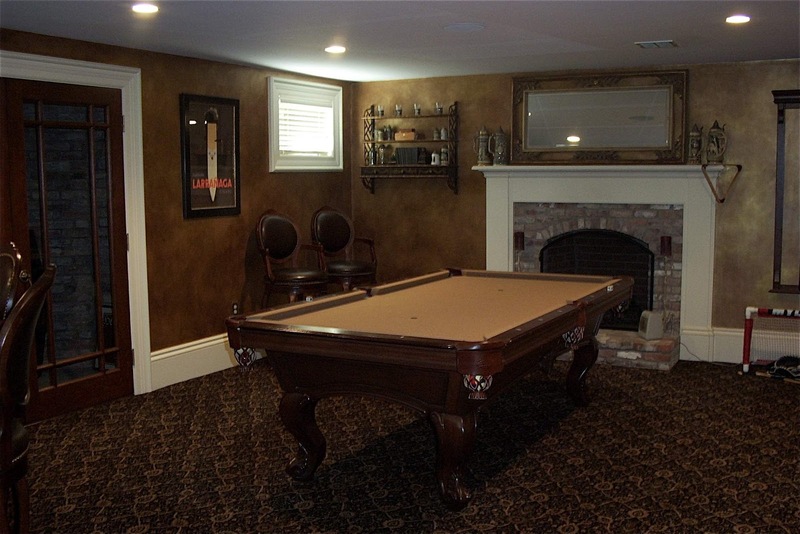 The first addition project included a large “man cave” done in rich, deep colors. 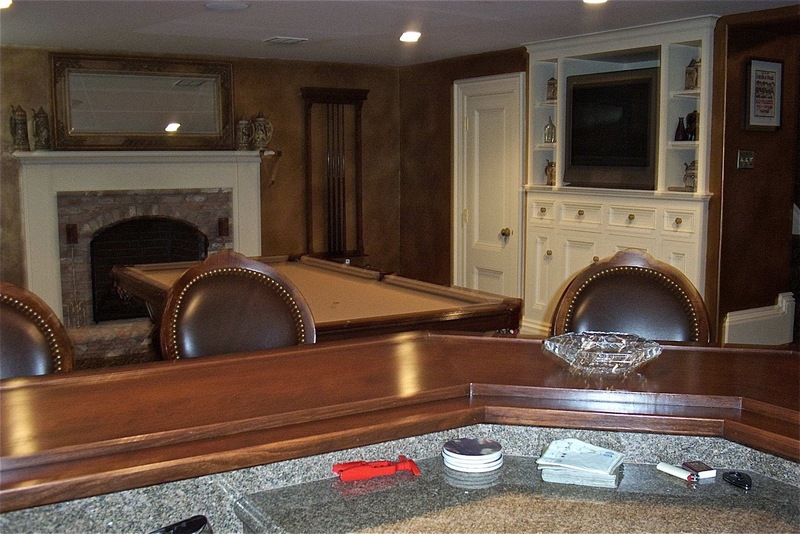 The space features a pool table, custom built bar area and cabinetry, and a wine cellar (doors on the far left). There is no doubt that every square inch was put to good use in this house. Back out doors (smell the salt air?) 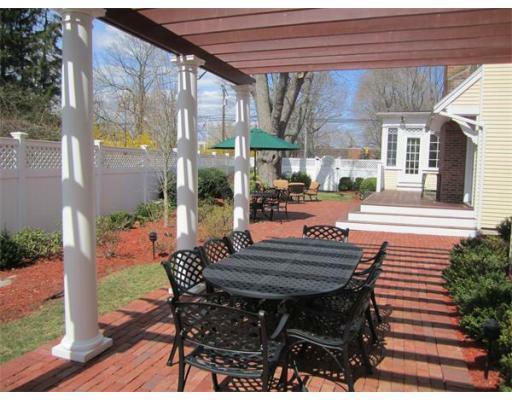 we have the side yard on the right side of the house, which features several small brick and deck seating spaces running the length of the house. On a personal note – if you look hard over the fence in the center back of the photo, you will see a brick structure across the street – that’s my old high school. While the house sits right among all the schools (making it perfect for families with children), the homeowner’s did a good job of obscuring the views and creating a private sanctuary amidst the hustle of an active school community. Here is the rear end of the house where you can see the music conservatory addition (set in) with trellis woodwork below and the roof deck walk-way above. The newest addition side entrance (to the tiled space above) and the garages. 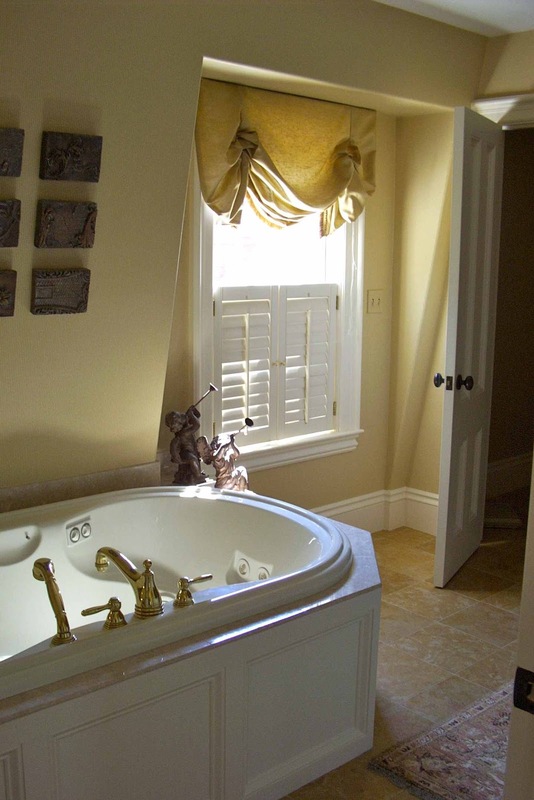 The oval window repeats the one in the dressing room. You can view the real estate listing here. It’s a great choice for anyone looking to live in an antique house that has all the updates and amenities of modern living. A note to the future homeowner – don’t even think about repainting the exterior! I love a yellow house and will be heart broken if you repaint!